Seattle designer Chrissy Wai-Ching has a truly global background. With Puerto Rican, Chinese and English roots and time spent living in international locales--including Hong Kong and Nice, France--it's no wonder the shapes and colors of the world's varied natural landscapes have become her biggest design influence. Wai-Ching stops by COLOURlovers today to chat about those influences, the general aesthetic and the processes that go into the bridal wear, apparel and accessories of her line, Wai-Ching Clothing. Tell us a little bit about your background, and how you came to design. I've always been interested in fiber arts, I have many artists in my family, and my Puerto Rican grandmother is an avid quilter. I've made clothing for myself since high school, and went on to study Textile Technology and Fashion Design in Hong Kong. What is your design perspective, and how does color play a role in it? Nature is my main inspiration, so I draw many of my colors and textures from it. Colors are central to the design process. I use color to evoke the feeling I want, and also to flatter the figure. Because I hand-dye and paint all the silks, I can add the colors in during multiple parts of the construction process and create a lot of depth. My current collection is inspired by the nature and colors of the Northwest. We have an extremely rich natural environment here so it's easy to become inspired by the flowers of the summer and various greens and bronzes of the rain forest. You use a lot of hand-dyed fabrics. Can you take us through the dyeing process? How do you showcase the material when it becomes a garment? I use only hand-dyed silks. Some of them I dye before they are cut and sewn into a garment. Some are garment-dyed, and some are dyed multiple times during the process. I use various techniques such as clamp and wax resist, shibori, and ombre. I love the irregularity and organic patterns of the hand-dyeing. That way, it can really showcase in the garment. 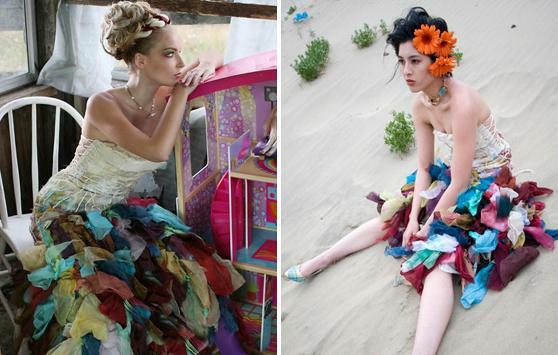 Many of your wedding dresses involve unexpected color. How do you incorporate color into a traditionally white dress? There are many ways to incorporate color into a traditionally white dress. Dip-dyeing can work well for a bohemian look, and well as unexpected color pops in the back of the dress. I often work directly with brides, so depending on their coloring, some look best with a color pop near their face. Shoppers can change the color of a garment or a garment's stitching before purchasing it. What is the theory behind that? Is every item made-to-order? Every item is made-to-order, often to the customer's measurements. Since we are producing the clothing that way and also hand-dyeing it, we are able to offer endless options for customizing design and color. Each garment is as unique as the person who wears it. Do you have a favorite design? If so, which is it and why? All the designs are like my babies, so it would be hard to just choose one! The Zolotova does have a special place in my heart though, since it was my wedding dress and it is so fun to customize since it is made completely of individual pieces of silk. What are you working on now? What can we expect to see in the future? I'm working on some new dress designs and jackets. I'm working off a warrior theme, so the pieces are all very strong and aggressive while still maintaining a feminine feeling. I've also been working a lot on my fiber art, which feeds my fashion design. Check out all of Wai-Ching's designs--and order your own--at her Web store. Photos courtesy Wai-Ching Clothing. Oh wow... Best blog yet of yours!!! Take your time and learn what it all about.